We are open year round. Checkout time is 11 am, and check-in time is after 3pm. We are just minutes south of Eureka Springs and all area attractions. All of our cabins are Pet Friendly and have either a Whirlpool or hot tub. . Family cabins can easily accommodate six guests. All of our cabins include: Complete Kitchens • Jacuzzi Tubs for Two • Native Stone Fireplaces • Charcoal BBQ's • Stereo • Remote TV/DVD • WiFi at the office. Special occasions deserve special settings. 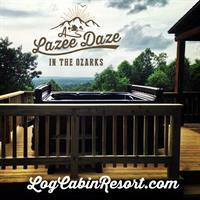 When seeking an intimate setting with all the amenities and comforts you require, imagine getting back to the beauty of nature while staying at A Lazee Daze in the Ozarks Log Cabin Resort. Here, your days are as Lazee or exciting as you would like. Located on 72 wooded acres in the beautiful Ozark Mountains of Northwest Arkansas, we are just minutes south of Eureka Springs and of all its area attractions. Our cabin rentals provide a unique country experience, allowing you to completely relax and enjoy your surroundings. Unwind in our intimate and romantic honeymoon and anniversary cabins or treat your loved ones to a stay in one of our homey family cabins. Even bring your family's furry friend along; A Lazee Daze in the Ozarks is pet friendly for your convenience! On the outside, our exceptional log cabins are natural and rustic while beautifully finished and furnished on the inside. All cabins are non-smoking and come equipped with either a Jacuzzi tub, outdoor hot tub or both, flat panel satellite TV. All you need to bring is food and charcoal for the grill and DVD's and CD's for your entertainment.